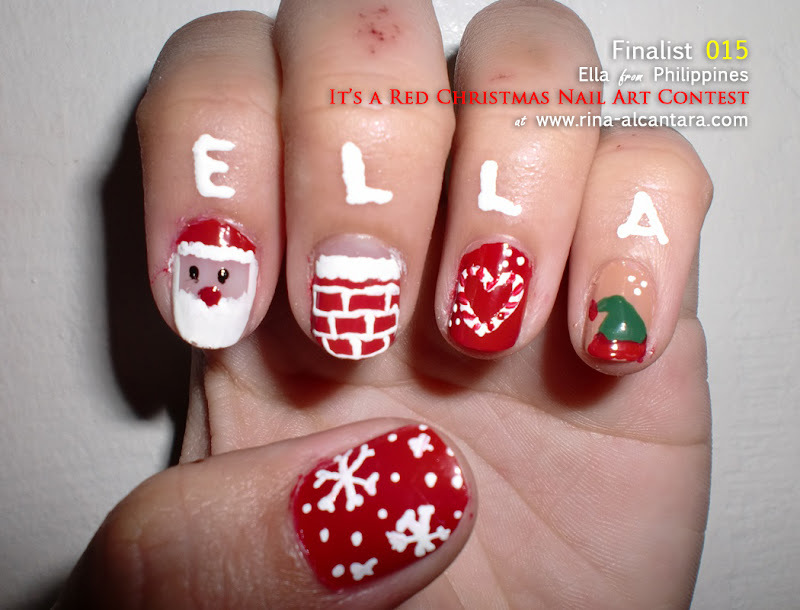 Our "It's a Red Christmas" nail art competition is now over. 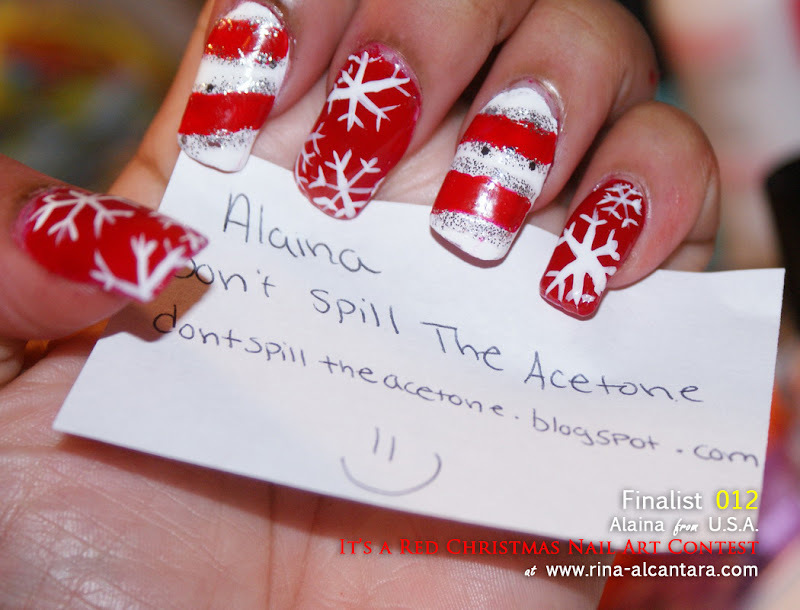 All nail art entries were carefully reviewed to make sure that each participant followed the contest guidelines. All valid and invalid entries received an email of confirmation or an explanation to why an entry is invalid. In the Netherlands, Christmas isn't a big thing like in America. We celebrate Sinterklaas. As the Dutch colonised in America, we brought the tradition of Sinterklaas with us, which is the reason everybody celebrates christmas with Santa Claus. So I decided to do nothing with christmas trees, Santa claus or reindeers, but to go back to the original story of christmas: the birth of Jesus. An acrylic painted vintage Christmas postcard on a handpainted red Christmas Tree ribbon. To interpret the theme "It's a Red Christmas", I decided to paint different Christmas characters, all sporting something red -- a penguin with a red scarf, a Christmas caroler wearing a red Santa-inspired hat, a snowman with a red striped scarf and a red ribbon across his hat, and of course my own version of Rudolph with his naturally red nose! I also painted my pointer red and put a snowflake on it to be in sync with the competition's poster. I used green as a background for a couple of nails to balance out the reds and give it a more festive look. 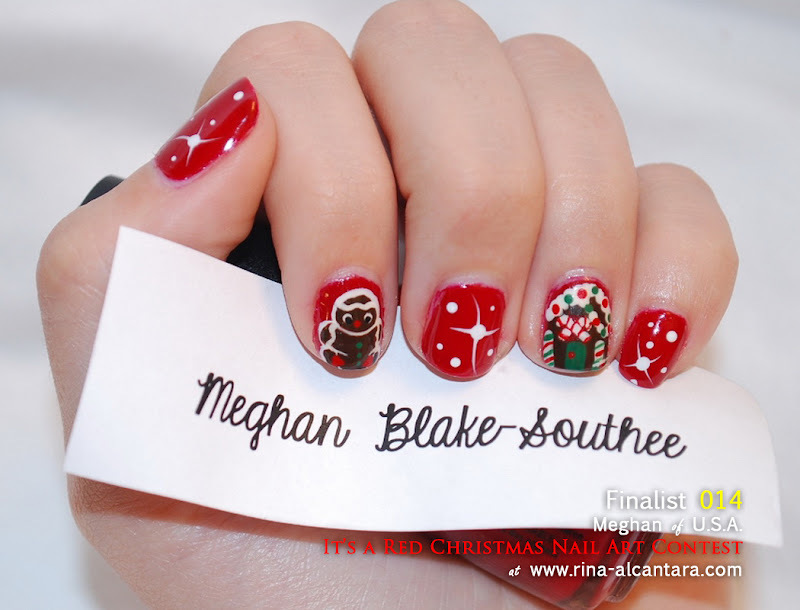 All designs were painted using acrylic paint and nail art brushes. 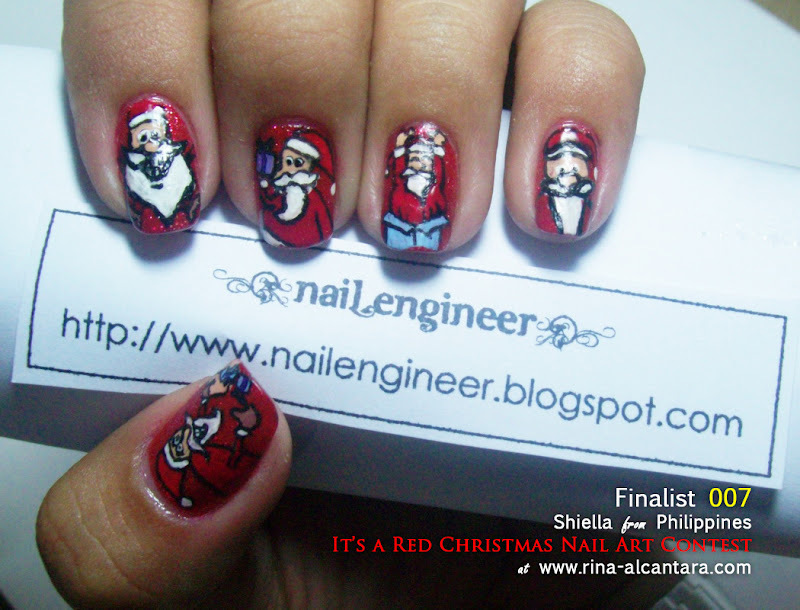 I chose to use the idea of ‘his and hers’ Santa outfits on the pointer and ring fingers. 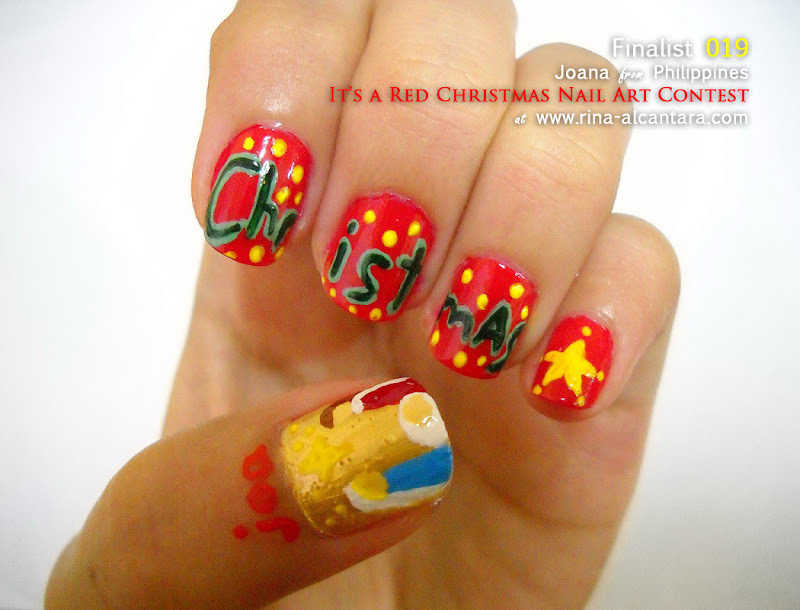 The other nails are simply Christmas trees in snow with a twinkly red sky, conveying a red Christmas. Mr. Snowman is enjoying his glittery red christmas this year! He looks forward for his christmas eve with tons of gift under christmas tree! "the moody santa" like any other person, santa also has different moods.. every nail has a unique mood of santa claus..
Fair isle sweater inspired! 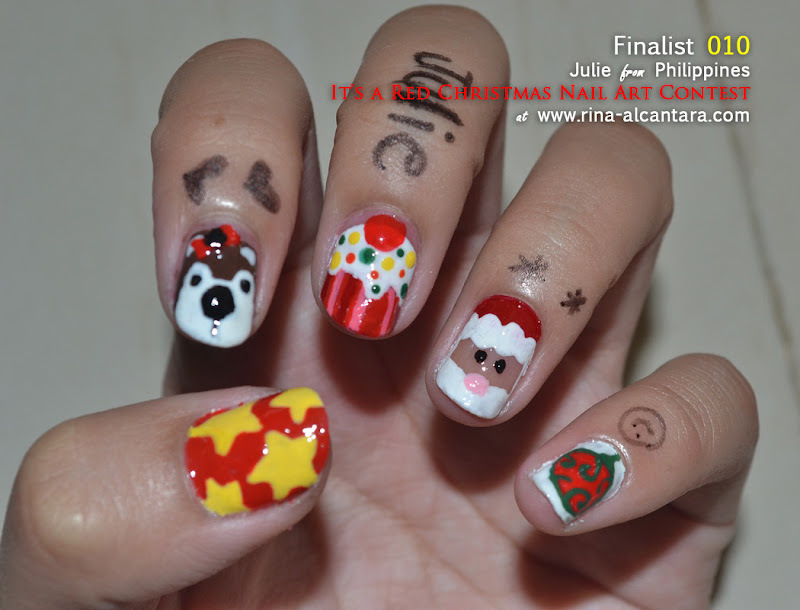 With a reindeer on the thumb! 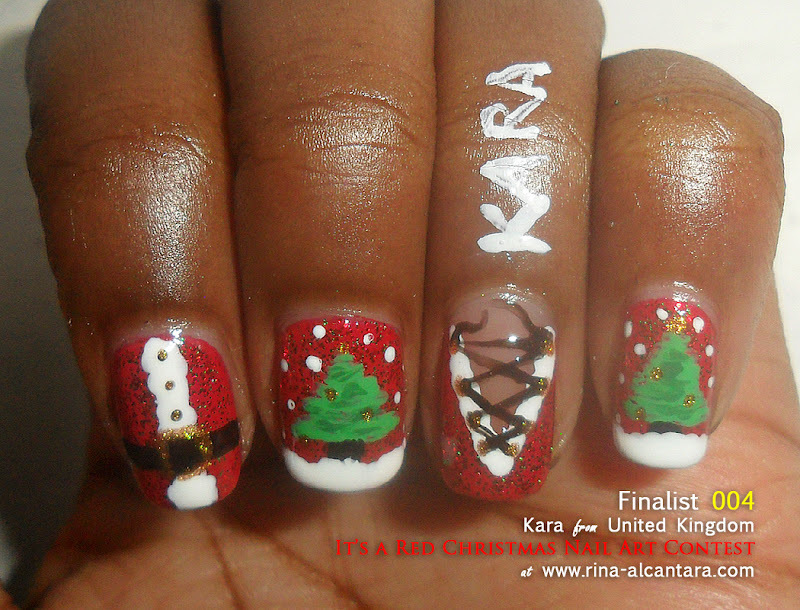 My nails represent the essence of Christmas, which is snow. For everybody Christmas means looking outside the window when it's snowing and making funny looking snowmen, this is what my nails are about and red is the most representative color for this time of the year. 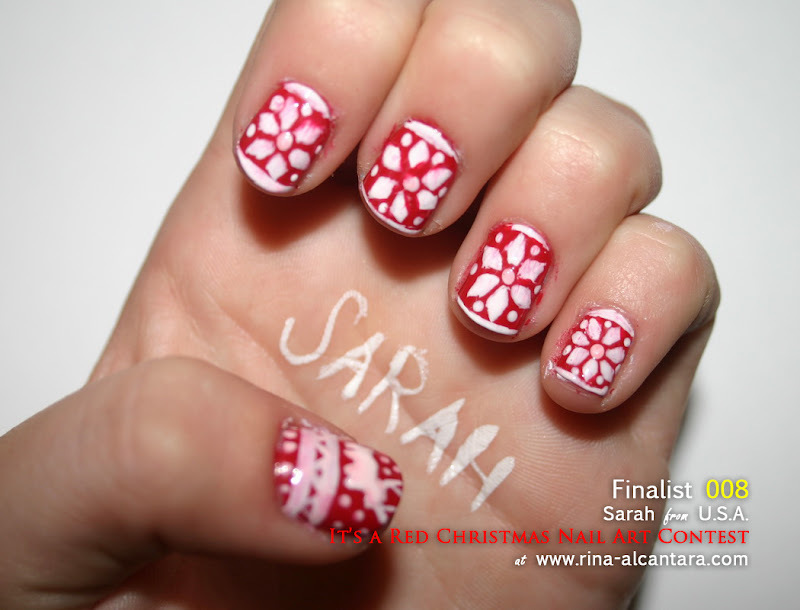 Snowflakes and Candy Canes on a red background. Note: No description was provided. 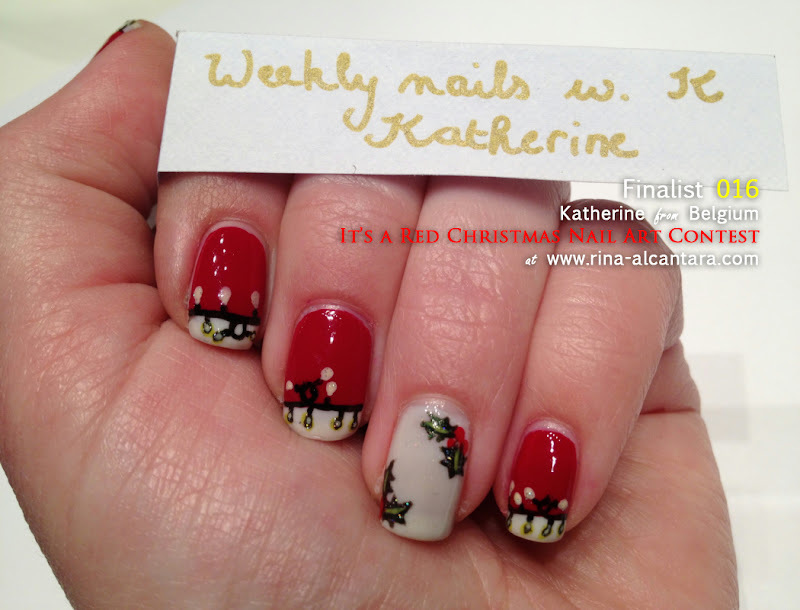 I am calling this nail art "Red Gingerbread Christmas". 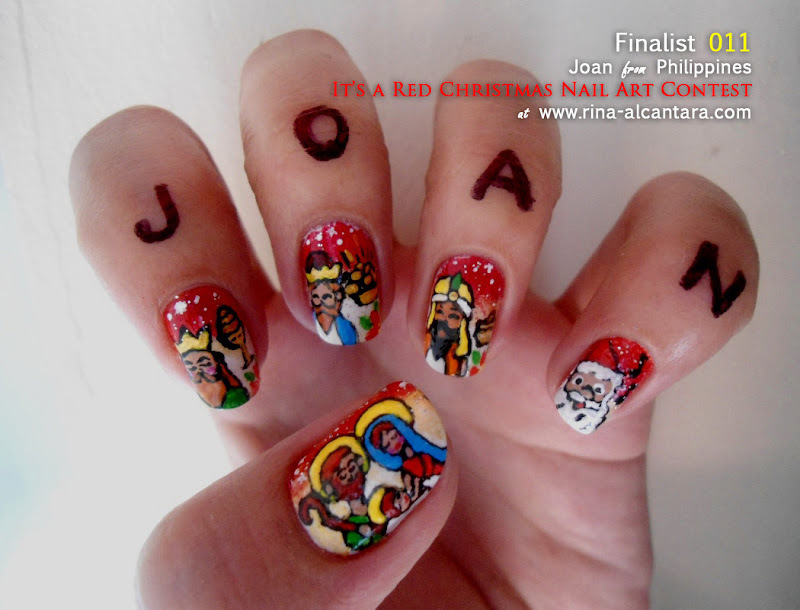 I am very excited to be a part of your "It's a Red Christmas" nail art contest! 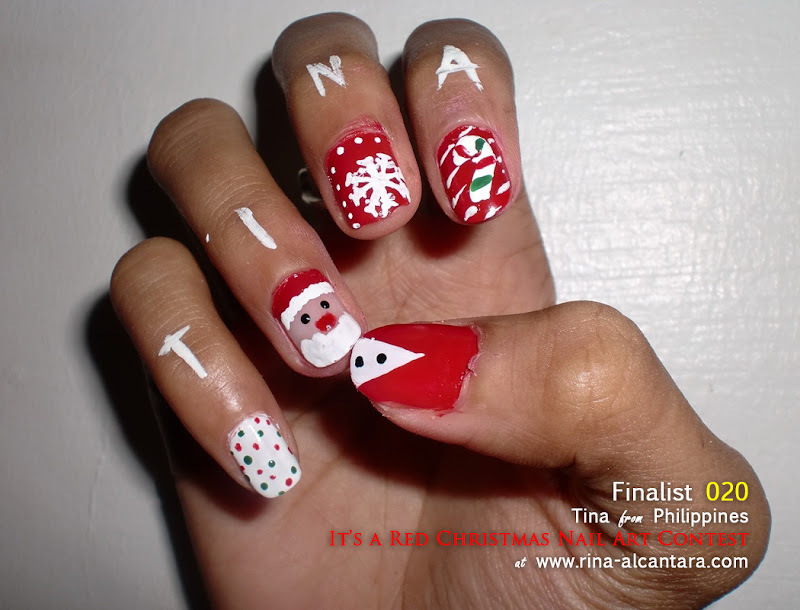 I am a huge fan of your nail art and love how precise and neat your work is! As a kindergarten teacher, I got my inspiration for this nail art from reading many gingerbread stories to my students over the last two weeks. I want to thank you for this opportunity and say good luck to all! My nail art has an accent nail with a white background and holly (with very little glitters). 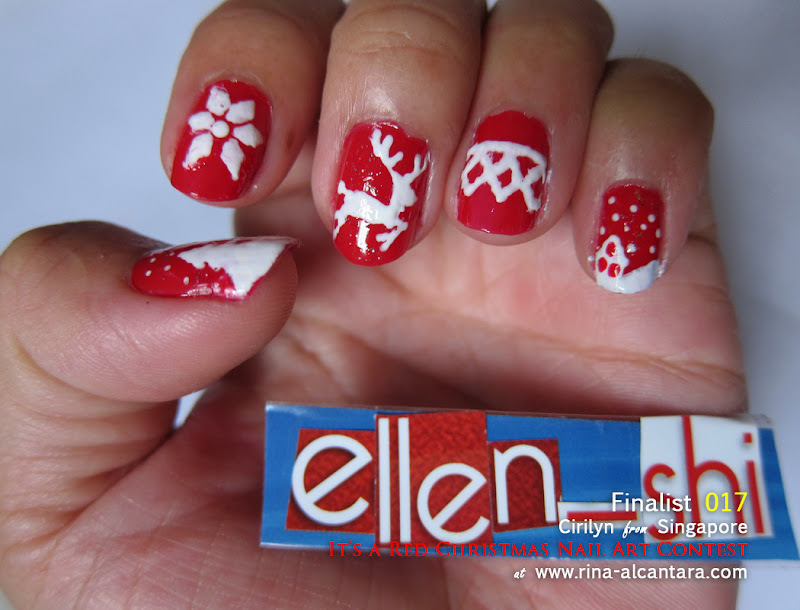 The other nails are inspired on Santa's outfit (red with a white border (same white as the accent nail)). These nails are also decorated with Christmas lights, because we all need a bit of light (and cosy decoration) on Christmas. The lights have also little glitters, so that they sparkle more, as if they glow on my nails. 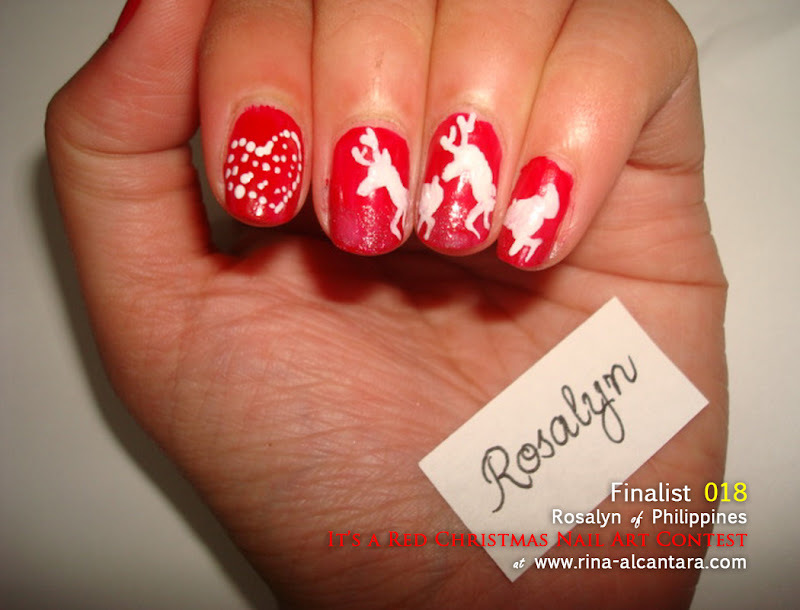 I don’t have a nice title for the entry, but maybe I can just call it “Red Christmas Nail Art” I got the inspiration when I went to a mall and saw a Christmas hat with reindeers. This is my idea of a "Love is in the Snow" Reindeer romance. It is a puzzle nail art and very fun to do. Hope your Christmas would be red with Love too! made a design of the nativity because the real reason of celebrating Christmas is the birth of our dear Jesus Christ. I used nail polish for the base and acrylic paint for the design. 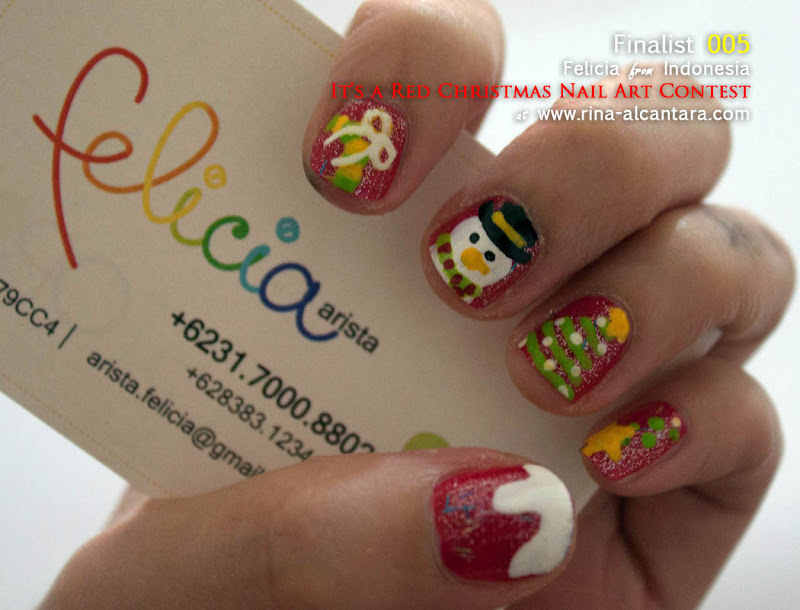 To feel the spirit of christmas, I painted santa with his suit, snowflakes, sugarcane and made a simple, dotted green and red design. 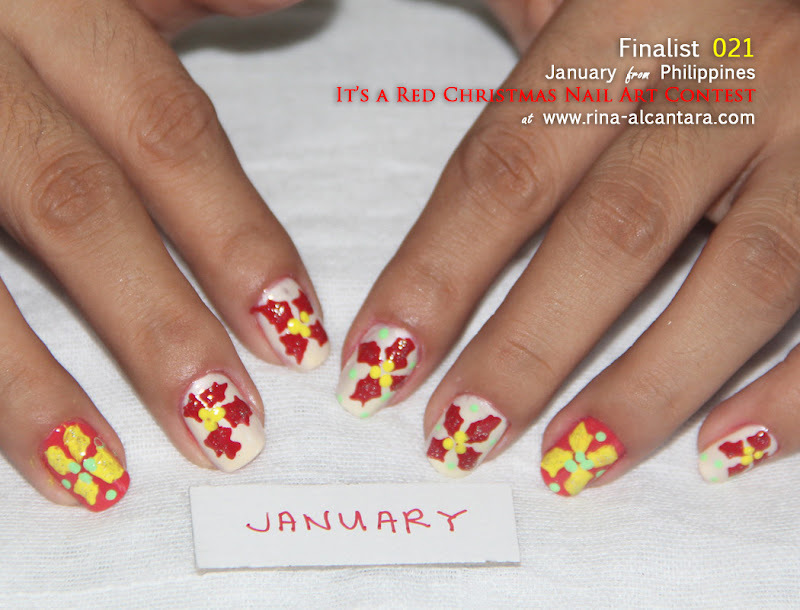 Because I see these Christmas Flowers everywhere, I chose to paint Poinsettias on my nails. 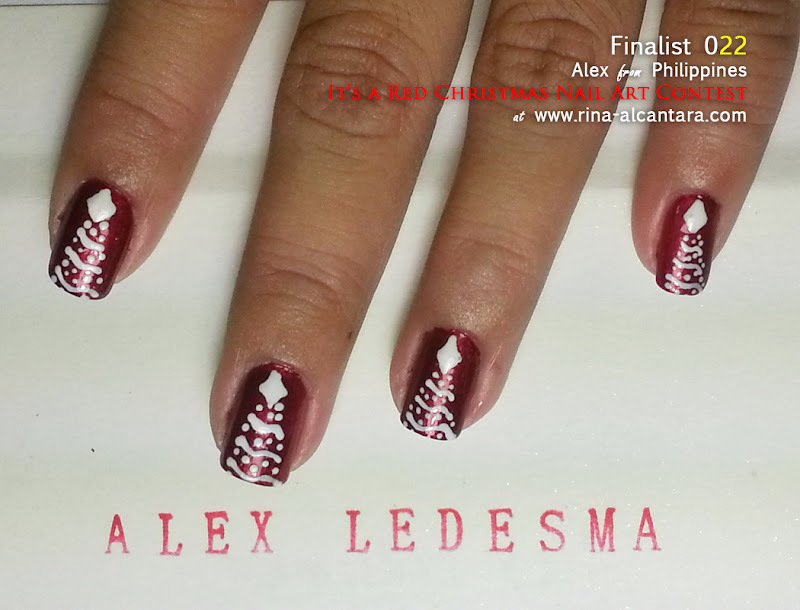 My nail art is a really simple Christmas tree design. It has a plain white foreground with a beautiful metallic red color as the background. 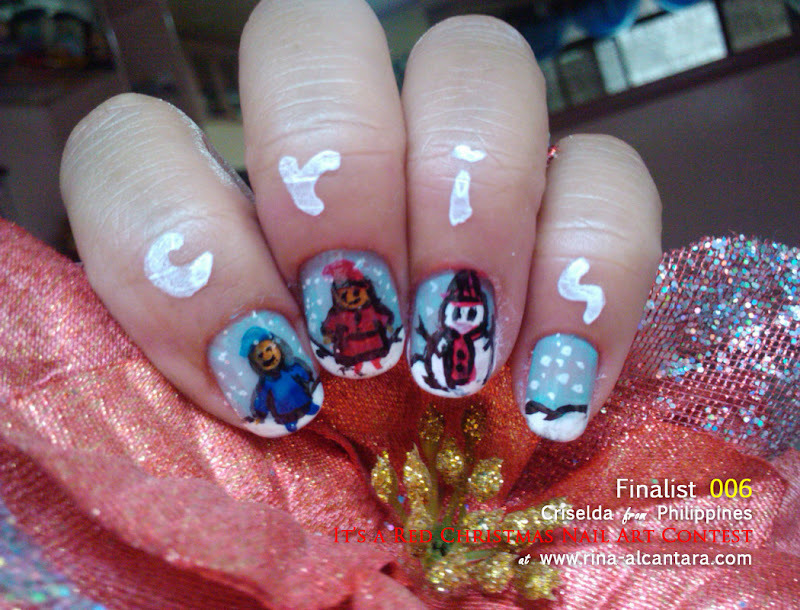 My nail art shows that Christmas is about sharing. We can b a santa for someone. So a lil gift to some needy can bring joy to his Christmas as well. The average score from all the 3 judges will determine the final score of each entry. One (1) winner will be announced on December 15, 2012. The announcement will be posted here on Simply Rins on a separate post and on Facebook.The winner will also receive a notification email and will be given 48hrs to reply with the required details. If in case the first winner fails to reply, a new winner will be announced. REALLY great entries! I cant wait to see who wins! i got my personal bet! merry christmas everyone! Oh they are all pretty! But i love looking at entry by Anna from Italy. They are all great, but I really love 009. 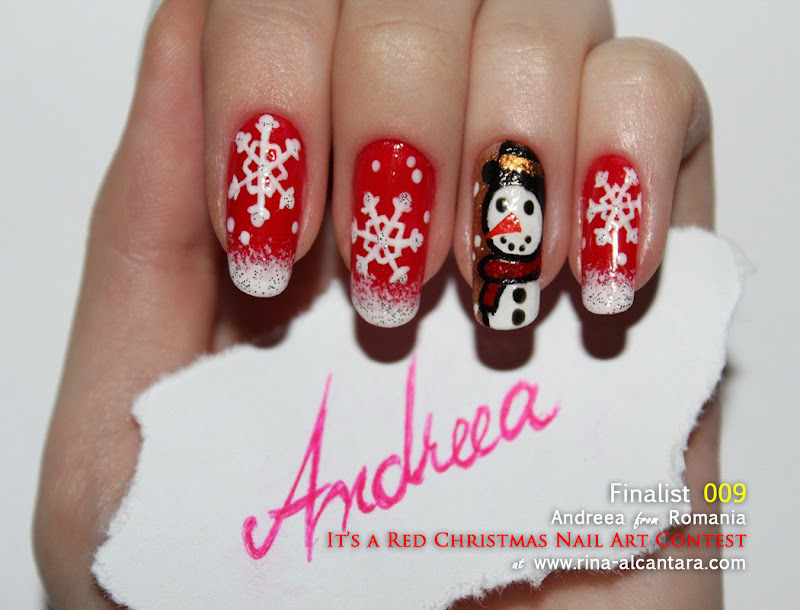 Andreea, your nails are AWESOME! Congratulations Andreea from Romania. Really enjoyed seeing all the entries, all very pretty and creative!